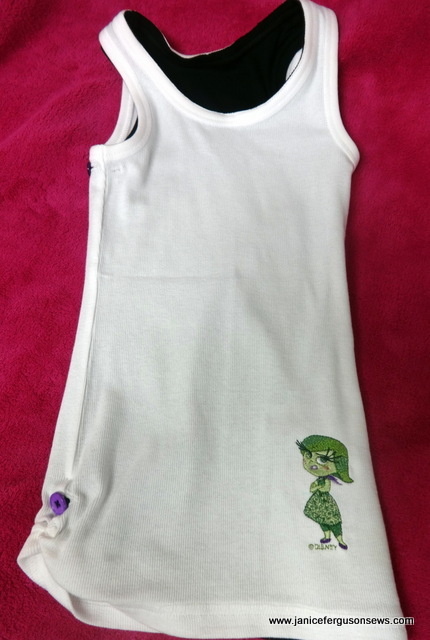 The shirt embroideries are Brother’s Inside Out designs. It was June Mellinger’s creative idea to embroider two off-the-rack tanks and stitch them together . This makes one embroidered tank top, making it reversible— or wearable “inside out.” With this inspiration I embroidered 6 tanks and ended up with 3 reversible tops. Feeling irate that things didn’t go as planned? This shirt let’s your world know you are angry. Like Superman’s duds, the shirt could be reversed in the bathroom when the mood is reversed. Do you remember Superman in the phone booth? Do you even remember phone booths? Of course they are no longer so the ladies’ room would have to do. 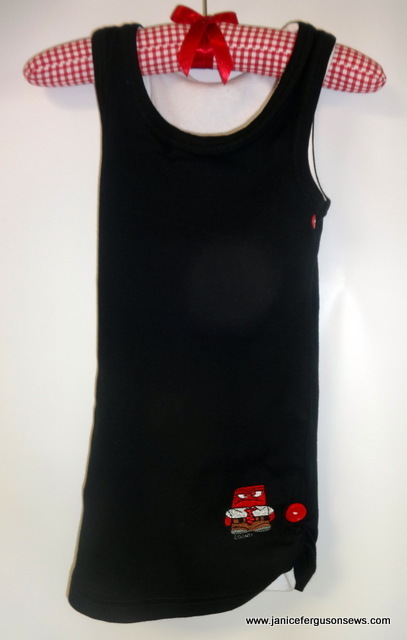 One side of each tank was ruched up with elastic and topped with a button. I’d like to have ruched it up higher, but I didn’t have a child handy to see just how high would be too high. So this little bit of elastic had to do. Just above the button on one side and below the button on the reverse side is a buttonhole which keeps the two shirts in alignment while being worn. Appalled at a friend’s behavior? Wear your Disgusted shirt. Buttons and buttonholes were also added at the underarm. Like the underarm buttons this adds a little more color and interest. It also helps to keep the two shirts working together. In a panic that your cell phone is lost? The Fear shirt is just the thing to wear. A tiny zig zag stitched the two shirts together at the neckline. 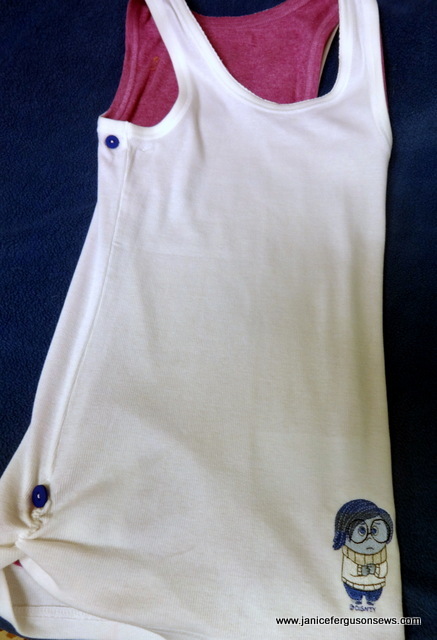 With the colored shirt on top of the white tank, monofilament was in the needle and bobbin thread was selected to match the color of the second shirt. Your cell phone was dropped and broken? Sad shirt says it all. Of course, Inside Out designs are not the only ones which can be used. I can envision reversible tanks embroidered with a computer and the text BUSY, then reversed to an embroidered beach scene with text RELAXED. Or a cupcake with FEELING SWEET, reversed to a lemon with SO SOUR. You get the idea. Now, I’m back to sewing boring new kitchen valances. What are you stitching? 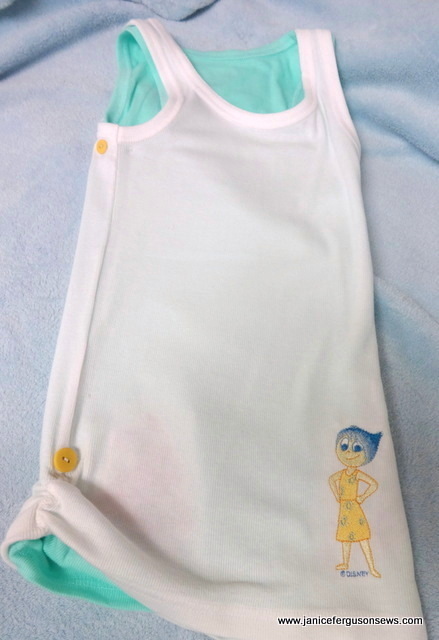 This entry was posted in Disney, Disney projects, embroidery blanks, machine embroidery, techniques and tagged Inside Out, machine embroidery, reversible tank. Bookmark the permalink. How adorable! What a good idea to make reversible tanks. I’m just stitching some napkins but I’m using pin stitch for the borders. Very tiring on the eyes. Cynthia, I’m glad you like this idea. The tanks are actually a little thin, so the double layer helps maintain some modesty. When your tired eyes are rested they will be so pleased with the classy and classic look of the pin stitch. I LOVE pinstitch and use it every chance I get. Such a great idea for tank tops. I am sure that your daughter will be stopped to ask where they were purchased. Have a wonderful day, Janice! Thanks, Karen. Now that I realize other “moods” could be used with appropriate designs, I have lots of ideas. But I have even more ideas and plans for baby girl clothes for Vivian Rose. You must be getting ready for school to start and wrapping up your summer. Enjoy what’s left of the lazy, hazy, crazy days! Janice, this is fantastic! The layered look is very trendy. The ruching sets them nicely apart from ordinary tanks. Is this for Laurel? I bet she loves it! Jo, I’m glad you like it. The trendy layered look is nice and the extra modesty it offers a pre-teen is great. But it just seems to be very warm for Florida summer. Oh, well. Are you gearing up and sewing for the new school year?